How often should they have a bath? How often should you brush them? Could they have a coat trimmed in the groomers or not? I have read some posts saying no it won't grow back and some saying it's fine. I have noticed my doodle Has some dandruff on her legs and her one hip side... I don't know why, it's flaky as if I were to have dry skin and scratch and gave the dead skin. Wondering if she has dry skin or perhaps she is sensitive to something. She does go in the sea a lot for a paddle, I bathe her about once a month and wash her in puppy shampoo and shower her off. I also have an F1 very similar looking to yours. Can I ask where you got her? Anyway, I would look at food first as a poor quality diet may cause skin issues. What do you give her? This website is great for evaluating and pricing food allaboutdogflod.co.uk. I bathe sometimes daily, sometime monthly depending on what she’s got up to. I use a lovely 100% natural shampoo from herbal pet supplies which makes her fur shiny, glossy, soft and sweet smelling. She is also groomed every three months professionally. This costs £25 and it does neaten her up and in fact her coat has come in thicker since we started this routine. I brush most days but just two minutes a time which keeps her coat in good nick. I got her from a private sale, not a professional breeder. She was on a small holding in Wales running around with loads of animals and seemed really good for her socialisation. She's was £1000. Was legit as I had met all the pups and mum twice. She has the pets at home own brand it Hinksey its called Ava. I'm not good at breaking down the nutrition quality but I was informed by my friend who also has dogs that it was one of the higher end foods along with royal cain. I may give it a go and book her in with a groomer. I just wasn't sure if the rumors were true that an f1 coat won't grow back... She is very thick haired so I think it would help her. I would agree with what what coco and Annie has posted. Check out the website mentioned www.allaboutdogfood.co.uk it might surprise you exactly what grading some of the so called higher quality dog foods get. Use a good quality shampoo and brush or comb regularly. I groom mine everyday, doesn’t take long and if done regular it’s a lot easier on the dog and you. 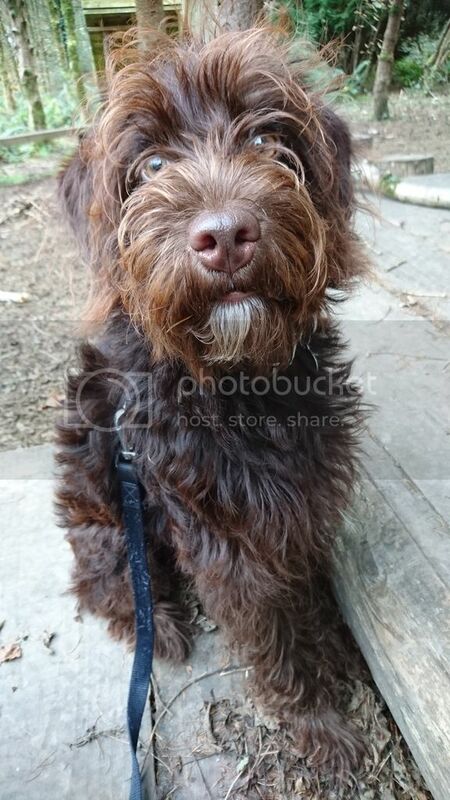 I have an F2 labradoodle - looks very like yours but a little curlier in places. He is washed anything from daily to monthly depending on how "crunchy" he gets when running in mud on walks. I am also worried about having him trimmed because he has golden highlights over his head and shoulders and down his tail, and mushroom highlights on his chest and legs at the moment - very pretty. But increasingly he is getting dreads on his legs, which I snip off when he sits still long enough.